Poodles, Schnauzers, Labradors and Beagles! Oh My! For all your many dog lovers out there – our fabulous assortment of dog themed cookie cutters and decorating ideas. Over 40 breeds to choose from. 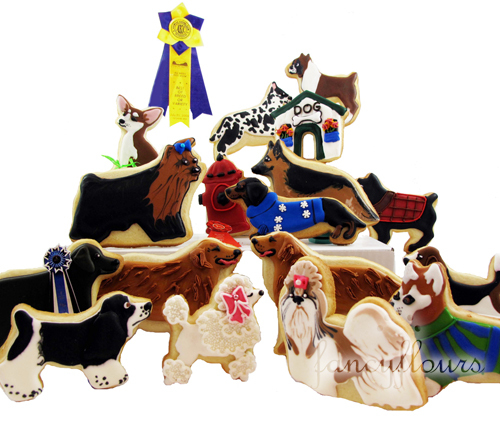 Take a peek at all our different dog cookie cutters by clicking HERE. Photos on our website show detailed decorating ideas for you to try. Keep your pooch happy with a batch of homemade dog treats. View our entire collection of dog themed product HERE. This entry was posted in Cookie Recipes & Ideas and tagged cookie cutters, Cookie Recipes & Ideas, dog, fancy flours, sugar cookies by Fancy Flours. Bookmark the permalink.